The IBEW has been around as long as the commercial use of electricity itself. It is the oldest, as well as the largest, electrical union in the world. The telegraph connection between Washington DC and Baltimore was the first large-scale commercial electrical accomplishment and those wires carried Samuel Morse’s famous message in 1844. This changed the use of electricity from a dangerous experiment to a useful, marketable commodity. In 1848 the first telegraph office was established in Chicago and by 1861 a web of telegraph lines crossed the US. Men flocked eagerly to become Linemen in this exciting new profession. Edison’s invention of the first commercially successful incandescent lamp in 1879 proved electricity’s usefulness and soon the power and light industry was established in New York in 1882. In the 1880s, Linemen worked 12-hour days 7 days a week no matter what the weather was like. They made 15 to 20 cents per hour or $8.00 per week. The death rate of a Lineman on the job was one out of every two. That was double compared to workers in other industries. At the Second Convention of the National Brotherhood of Electrical Workers (as the IBEW was then known), first Grand President Henry Miller said, "No brands of skilled labor ever presented a more unorganized or demoralized condition than that of the Electrical Workers of America in the year of 1889." In 1890, St. Louis hosted a national exhibition featuring electricity. Electrical workers came from all over the United States to work wiring up the displays and decorations. The men talked to each other and the stories were common. Poor working conditions, knowledge gained by trial and error and safety was unheard of. The need to unionize was strong. At a meeting in Stolley’s Dance Hall in St. Louis, Charles Cassel of the American Federation of Labor met with the electrical workers, and Local 5221 of the AFL was formed. Henry Miller, a St. Louis Lineman, was elected President and J.T. Kelly, a wireman, vice-president. These men realized that strength was in numbers and a sole lonely group would accomplish little. They set out to organize other locals, with a vision to bind them all together to form a national organization of electrical workers. On November 28, 1891, ten men – T.J Finnell, F.J. Heizleman, E.C. Hartung, Henry Miller, J.T. Kelly, William Hedden, C. J. Sutter, Joseph Berlovitz, M. Dorsey, and H. Fisher – representing 286 members met at what became the First Convention of the National Brotherhood of Electrical Workers. They created the Constitution and adopted a logo, a clenched fist holding lightning bolts. Henry Miller was elected the first Grand President with J.T. Kelly the first Grand Secretary-Treasurer. A motion was made to affiliate with the AFL and on December 7, 1891, the NBEW was granted a Charter giving the organization jurisdiction over electrical workers in every branch of the trade and industry. By the time the second Convention came around in Chicago a year later, there were 43 Locals. Per Capita was set at 10 cents per month. The first women came into the membership employed as telephone operators. Henry Miller and J.T. Kelly were re-elected. The second convention also gave birth to the Journal called “The Electrical Worker” and the first issue was printed on January 15, 1893. 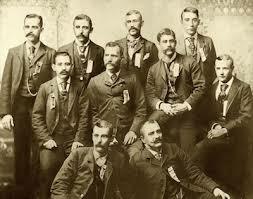 In 1894 initiation fees were $5.00 and Per Capita was set at 25 cents. The 15-cent increase was voted in at the Third Convention in Cleveland due to the escalating costs the NBEW had to bear. Members also voted to hold conventions every two years. On July 10, 1896, Henry Miller, at 38 years old, died as a result of injuries sustained while working for the Potomac Electric Power Company. After receiving a severe electrical shock he fell from the utility pole, striking his head. Still conscious, he was carried to his rooming house and treated by a physician. He died eight hours after the accident. At the Pittsburgh Convention in 1899, the "National" became "International" with the first Canadian charter for Local 93 (now Local 586) organized in Ottawa on December 20, 1899. Labour organization was on the rise and the IBEW was at the fore-front of the organizational sweep. Local 213 of the International Brotherhood of Electrical Workers was issued its charter on November 6, 1901, the first local of the fledgling international union to be chartered in Western Canada. It all started in a non-descript room in Vancouver where a speaker from Local 77 in Seattle (Chartered August 28, 1897) was brought in to speak to a number of electrical workers in a single meeting. The Charter, granted to "Thomas Proctor, A.D. Hotson, W.S. Saxton, E.H. Morrison, C.H. Fletcher, D.M. Burns, Percy G. Farr, J. Lloyd and H. Hedemark and to their successors, power to establish and hold a Union of the Brotherhood, to be located at Vancouver in the Province of B.C. and to be known as Union No. 213 of the International Brotherhood of Electrical Workers." The roll of officers in January 1902 were George Cowling - First President; John Dubberley - Financial Secretary; A. Cherrill and W. Blackstock - Trustees; S.F. Arthurs - Examiner; H.H. Free - Inspector; A.E. McCartney, B.P. Irwin, C.H. Barker, and J.A. Dillabough. The first meeting minutes, after the Charter was granted, had Joseph Rogers, A. Fraser, and W. Thompson along with J. Aheren "put through the obligation". Initiation fee at that time was $5.00 and the recipts of the evening amounted to $22.80. Local 213 was drawn in to Vancouver Labour through the Trades and Labour Council (est. 1899) of which the Local had joined on January 28, 1902. Local 213 became recognized as on of the most progressive units in the council. At a special meeting February 22, 1902, called at the New Westminster power-house, John E. Brown, Thomas Gifford, Thomas A. Campbell, C.F. Eichhoff, and J.C. Bigby were initiated. J.C. Bigby was elected Chairman of the New Westminster Branch of Local 213. In May 1902, the Local Union affiliated with the Building Trades and by August of that year had gained a big certification of the Linemen and repairmen at the New Westminster and Burrard Inlet Telephone Company (Later BCTel now Telus). In October 1902 the Local organized the women telephone operators at the phone company into an auxillary local of local 213. The auxillary local had its own meetings, elected its own officers and operated as an independant local with two delegates from Local 213 sitting as liason. The auxillary was one of the first successful efforts to organize women workers in B.C. On November 26, 1902 the IBEW members, both men and women, struck the company demanding an eight-hour day, increased wages and union recognition, all of which they won! The Local continued to grow in those early years, eventually organizing BC Electric Company, the predecessor to BC Hydro, in 1907. From 1908 to 1914, in the years leading up to the First World War, internal issues in the IBEW gave rise to a split between the Linemen led by Reid, who wanted a loose federation of Locals, and the Wiremen led by McNulty, who favoured a more centralized structure. It became known as the Reid-McNulty split. The American Federation of Labour investigated and sided with the McNulty wiremen. Local 213 had been chartered as a Lineman’s local and had sided with the Reid Linemen. The dispute left the Local divided and weakened and took some time to heal, leading all the way up to the beginning of the First World War. During the time of this divide, the Union Local established the 8-hour day at BC Electric In 1910. In 1918 the Local signed a blanket utilities agreement with BC Telephone, BC Electric and Western Canada Power Company. The wages rose to $6 a day, up from previous levels of $3 to $5 a day. The post-war years were turbulent times for the union movement and our local. The Winnipeg General Strike in 1919 caught the sympathy of unions throughout the west. Local 213 participated in the month-long Vancouver sympathetic strike, which landed the local in hot water with the International Office. They viewed the Winnipeg General Strike as an action by the One Big Union – OBU – which was viewed as a threat by all international unions. Local 213’s Charter was suspended, and was only reinstated a year later by a court order. The IBEW had established Local 310 to replace Local 213 and as a result, Local 213 lost the telephone workers to Local 310. Local 310 disappeared in 1926 and BC Tel then established a company union. The depression years of the ‘30s were hard times for Local 213. There was high unemployment, virtually no construction and the largest employer, BC Electric, cut wages and shortened workers’ hours. But those still working were lucky and a fund was created to help those who were unemployed. But the advent of war production in 1939 created lots of new jobs in ship-building and other war industries. The post-war collapse of the ship-building industry was offset by the boom in the construction industry that lasted for a decade. Originally a Lineman’s local, Local 213 had inherited a sizeable number of wiremen in its ranks in the post-war period. In 1948 the Local established Livewire, the local’s first newspaper. Throughout the ‘50s, the Local continued its expansion. BC Electric’s gas workers, already in their own independent union, voted to join IBEW Local 213 after a two-year court battle. The ‘50s also saw the Local establish an employer-funded Joint Trustee Welfare Plan, the first in the construction industry. Also established in this decade was the Electrical Joint Training Committee aiding the education of apprentice and journeyman electricians, sound and communications technicians and motor winders. Local 213 electricians are among the best educated in the country. But the Cold War hysteria in the post-war era caused deep divisions in unions, including Local 213. In 1955 the IBEW International Office sent two representatives to Vancouver to look into allegations of communists running the union. The local was placed in trusteeship and Business Manager George Gee was expelled. Another fifteen members were suspended for 15 years. It solved nothing. For five years the union remained under trusteeship and was divided within between those who defended ousting Gee and those who saw the whole issue as a US backed anti-communist witch hunt. The trusteeship was lifted in 1960 and by 1964 Local 213 was once again on Labour’s frontline as it was the first to establish the 37.5 hour work week in the construction industry in Canada. In 1966 controversy surfaced again in the wildcat strike at Lenkurt Electric in Burnaby, after the company forced workers to work overtime during contract negotiations and sparked a wildcat walkout. Local 213 members defied a court injunction to end the picketing, and dozens of workers were arrested and charged. Twenty-two were convicted, and sent to jail for periods ranging from one to four months. At the beginning of the strike the International Office ordered Local 213 Business Manager Art O’Keefe to end the wildcat. O’Keefe refused, and was suspended (the suspension was lifted at the next International Convention). He was also one of the leaders jailed for his part in defying the court injunction. In 1967, in the aftermath of the Lenkurt strike, The International Office divided Local 213 into three locals: BC Electric workers went into newly Chartered Local 258; Local 264 was chartered to represent members who worked for the electrical manufacturing companies (Local 258 and 264 later merged); and Local 213 continued to represent construction, alarms and communications workers. The post-war construction boom was good for members of Local 213, who had enjoyed years of steady work. But the Social Credit government of W.A.C. Bennett also turned its attention to unions by introducing changes to the labour code. In 1972, the government introduced Bill 88 which would have destroyed the dispatch system (Hiring Hall) and disallowed many other union security provisions in contracts. The bill was dropped after massive protests by the labour movement, but the government had showed its hand. The Construction Labour Relations Association (CLRA), representing building trades employers, attacked the dispatch system in negotiations. The issue ended up at the BC government’s Mediation Commission, and six building trades unions - Electricians, Carpenters, Plumbers, Boilermakers, Cement Masons, and Heat and Frost Workers - formed a pact dubbed “The Six-Pact” to fight the issue. The day after the unions announced their pact, their offices were raided by the RCMP, who confiscated files. The warrants RCMP used to raid union offices were quashed by the courts a week later, and when the Barrett NDP Government was elected later in 1972 they dismantled the Mediation Commission. In December 1972 the Union Struck the BC District Telegraph Company (Now ADT) in what would become one of its longest strikes in the Local’s history. The Strike lasted until January 1975. The ‘70s saw unprecedented growth in BC, and Local 213 was a big part of that. It was at this time the union began to diversify. Electricity spawned electronics and the industry expanded and became more and more specialized. Local 213 members now worked with building fire alarms, security systems, computer and business machine technologies, electrical maintenance, the neon industry, electronic service, warehousing, electrical manufacturing, appliance service, motor winding shops and many other aspect of the trade not to mention the marine wiremen, construction wiremen, and the electrical and gas utilities. The explosion of the Cable Television industry spawned an entirely new set of demands for skills which had not existed in the past. The 1980s brought on renewed attacks by the conservative right-wing governments. The Social Credit party was under pressure from its supporters to bring in massive changes to labour organizations. As British Columbia celebrated its centennial in 1986 with Expo, the building trades were in a serious fight for dominance in the construction sector with the rise of non-union construction firms. Slowly but surely over the remaining years of the last century non-union forces began taking on bigger and more complex projects in the institutional sector, then commercial and now industrial. Non-union forces had always been active in residential construction, but the unions were always called on to do the big, important jobs. As that advantage dissipated the unions developed new strategies for maintaining their share of the market through such strategies as market recovery programs, enabling, and much closer relationships with contractors to secure work. Because of the high skill level of most electrical work and because Local 213 was more aggressive in maintaining market share, we fared much better than many of the other building trades. Thorough the 90s with innovation and technological know-how expanding, industries such as communications were converging at a rapid rate, the need to increase education among the workers intensified. On November 6, 2001 Local 213 celebrated its 100th Anniversary. It was dubbed “A Century of Pride”. Interestingly that statement rings true today as well as all the way back to our humble beginnings in 1891! For many years Local 213 operated out of premises on Norland Avenue in Burnaby but as we moved into our second century it became clear that our building was no longer able to serve the needs of a growing and modern union. In order to combine the busy Training Centre and the growing business office, Business Manager Rick Dowling made the decision to move. With the new location purchased and a new era for Local 213 about to begin, tragedy struck on May 31, 2010, when Rick Dowling passed away suddenly. After a difficult summer in 2010, the Local moved its offices to 1424 Broadway Street in Port Coquitlam in September. In Brother Dowling’s memory, the new modern facility, which houses union offices, training facilities and the health and welfare plan administrative offices, was officially dedicated in his name as the Richard Dowling Centre. Another major triumph and source of pride for Local 213 came about in September 2011. Marking a turning point in Local 213’s relations with the International Office, Vancouver hosted the 38th Convention of the International Brotherhood of Electrical Workers. 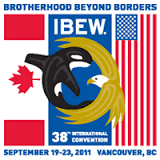 The BC Provincial council of Locals 213, 258, 230, 993 and 1003 welcomed Brothers and Sisters from the 11 Districts across North America to the IBEW-built Vancouver Trade and Convention Centre. In 2012, IBEW 213 created the Local 213 NextGen Committee that promotes activism and Union Pride in young workers aged 18 to 35. The Local continues to promote our diversity as one of our many strengths and joined with Local 258 to create the First Canadian Chapter of the IBEW Electrical Workers Minority Caucus (EWMC). The 2000s have brought in much innovation for clean or “green” energy. Wind and solar power have led the charge. By 2010 demand for vehicles that run on alternative fuels increased to the point of no return. Now electric charging stations are in demand and Local 213 is there to provide trained certified electricians ready for the new Green wave. 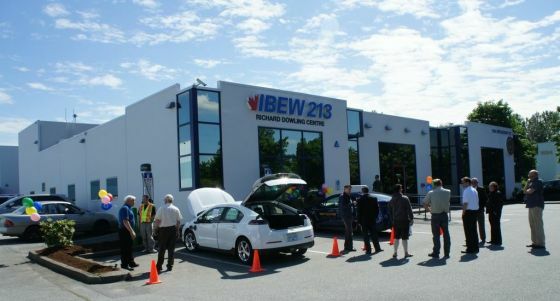 On June 10, 2013, the Local, in conjunction with the Electrical Joint Training Committee, hosted the launch of the first Electric Vehicle Infrastructure Training Program (EVITP) in Canada. It provides training certification to instructors who will train and provide certification for the installation of Electric Vehicle Supply Equipment. This initiative continues this union’s strong tradition of taking a leadership role in responding to new challengers in the industry, and ensuring our members have the skills and training to make a strong contribution in our changing world. In May of 2014, the youngest business manager in the Local's history, Adam Van Steinburg, was sworn in by Local President, Darcy Biln in the presence of the Executive Board. Brother Van Steinburg vows to continue the work of his predecessors with a focus on strategic planning and improved membership engagement to enable a stronger trade union in the years to come.